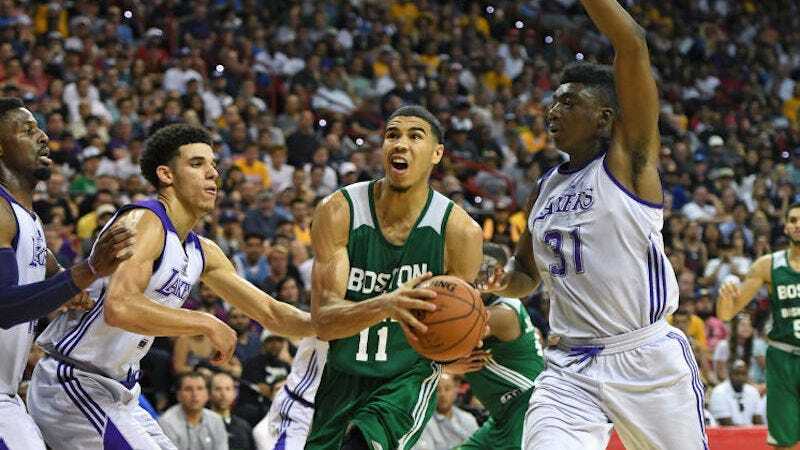 The Lakers and Celtics Summer League teams played Saturday in Las Vegas, pitting second overall pick Lonzo Ball against third overall pick Jayson Tatum. This was pretty fun! Lonzo Ball looked much more like a real NBA player than he did in his woeful Summer League opener Friday night, finishing with an 11-11-11 triple double in 34 minutes. His ugly jumper was still a mess—he finished 1-for-5 on threes—but he had some slick look-ahead passes in transition and a couple really nice layups in traffic. Jayson Tatum started his night with an audacious Dirk fadeaway from the baseline, and finished the third quarter with a pull-up banked three-point buzzer-beater. Frankly, he looks so much more dangerous pointed at the cup with the ball in his hand than Ball, flashing a couple sweet dribble moves and looking smooth and explosive going downhill through traffic. Tatum is a lot of fun to watch. On a night when first overall pick Markelle Fultz went down with an ankle injury, it was nice to see two of the other big names from the 2017 draft show out a little.